The first robotic-assisted PCI procedures were carried out in Asia using Corindus Vascular Robotics' CorPath GRX system. One of the procedures was transmitted live from Fu Wai Hospital to attendees at the China Interventional Therapeutics Conference. CorPath GRX has been developed to increase precision, improve workflow, as well as expand capabilities and range of procedures that can be carried out robotically. With 1mm advancement capability, the system enables physicians to independently and simultaneously control guide catheters from the workstation console. 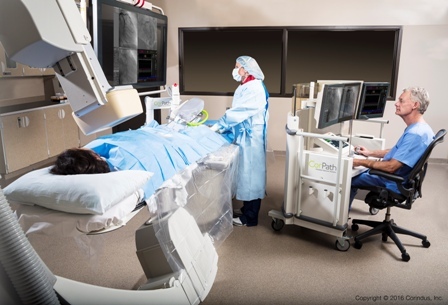 The precision positioning is said to allow physicians to adjust guide catheters during PCI procedures, helping to expand the use of the CorPath GRX System to more complex cases. Laid at Fu Wai Hospital for investigational use, the FDA-cleared CorPath GRX is claimed to be the first installed next-generation system outside of the US. Fu Wai Hospital’s cardiology department coronary artery disease deputy director Dr Kefei Dou has carried out the first robotic-assisted PCI procedures in Asia. Corindus president and CEO Mark Toland said: "We have entered a transformational period for our company with a focus on expanding our reach to partner with hospitals to build robotic programs globally. Image: Physician performing robotic-assisted PCI. Photo: courtesy of Corindus, Inc.